An easy one pot meal that's full of garlic, cheese, and flavor. Saute onion and garlic until fragrant and tender. Whisk in flour and cook for another minute, until golden. 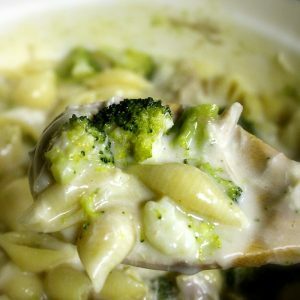 Add in chicken broth, milk, chicken, broccoli, seasonings and pasta, stirring well. Remove from head, and stir in cheese until melted.